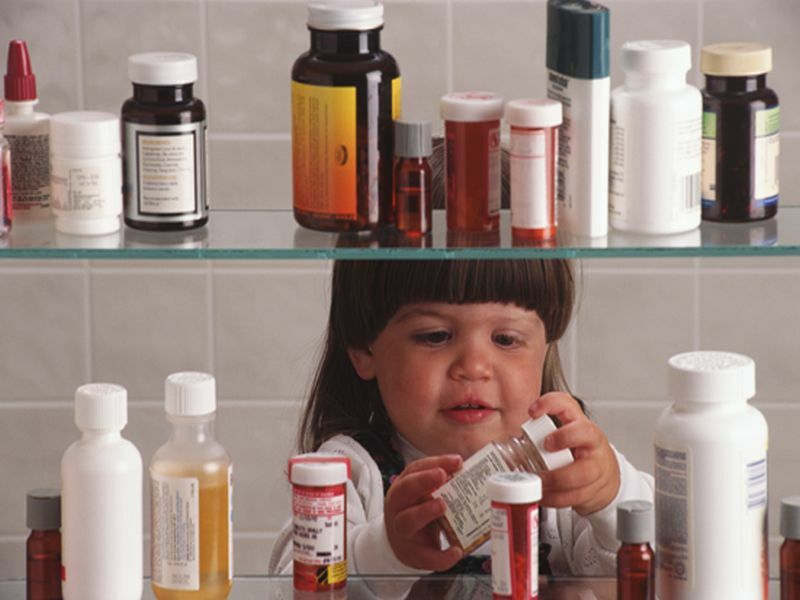 MONDAY, March 20, 2017 (HealthDay News) -- When you learn that just 1 in 5 Americans locks up prescription drugs, it's not surprising to hear that thousands of children are treated for accidental medication overdoses each year. A new Consumer Reports survey of more than 1,000 adults also found that more than one-quarter of Americans hang on to unused drugs "until they're used up." This ups the odds for misuse, too. "People may not realize how dangerous certain medications can be for a child," said Lisa Gill, deputy editor of Consumer Reports Best Buy Drugs. "Pills within easy reach can be as dangerous as a loaded gun, particularly narcotic painkillers, such as OxyContin, Percocet and Vicodin," she said. The bottom line: "If you have these pills at home, and you have children around, we urge you to lock them up," Gill said. The magazine staff also recommends cleaning out your medicine cabinet once a year to reduce the risk of medication misuse. The magazine suggests that the first day of spring -- Monday, March 20 -- is the perfect day to start this cleaning process, dubbing it, "National Spring Clean Your Medicine Cabinet Day." Don't assume that prescription drugs such as sedatives and opioid painkillers are the only drugs on your bathroom shelves that can potentially cause harm. "Acetaminophen, used as a fever and pain-reducer and found in Tylenol and hundreds of other products, is the most common accidentally ingested [over-the-counter drug]," Gill said. A child who takes too much acetaminophen can develop liver damage or liver failure, she noted. About 60,000 preschoolers are rushed to hospitals each year after accidentally swallowing medicine, whether prescription or over-the-counter, the U.S. Centers for Disease Control and Prevention says. Many of these emergencies are preventable. To avoid such mishaps, Consumer Reports shares some tips for safe disposal of your medications. Return unused medication to your pharmacy, hospital or narcotic treatment program for proper disposal. This is especially advisable for opioid painkillers such as oxycodone (OxyContin, Percocet) and morphine, ADHD drugs and sedatives such as alprazolam (Xanax) -- drugs with a high potential for abuse. If a pharmacy or hospital won't take them, ask your local fire or police department if they'll accept unused medication. Places that collect and destroy unused medications may also be found at DisposeMyMeds.org. This program is run by the National Community Pharmacists Association Foundation and the National Community Pharmacists Association. Mark your calendar for National Prescription Take-Back Day: On Saturday, April 29, the U.S. Drug Enforcement Administration will allow anyone to drop off leftover medications anonymously at designated police departments, fire stations and other facilities. The agency will run another drop-off day in October. For a small fee, some major pharmacy chains provide mail-back envelopes for prescription and over-the-counter medications. If you have no other choice, you can toss most pills in your household trash -- after camouflaging them. Hide them in coffee grounds, sawdust or kitty litter, and seal both in a plastic bag, the Consumer Reports staff suggests. But don't do this with dangerous drugs such as opioids because someone could grab them from the garbage. For dangerous drugs, the U.S. Food and Drug Administration suggests flushing them down the toilet. However, many advise against this because trace amounts of drugs can end up in the water supply.